Kate, Humphrey and their three wolf cubs — Stinky, Claudette and Runt — are back! Time to snuggle up with your own cubs to enjoy Alpha and Omega 2: A Howl-iday Adventure, recently released by Lionsgate in a Blu-ray Combo Pack and DVD available exclusively at Walmart. 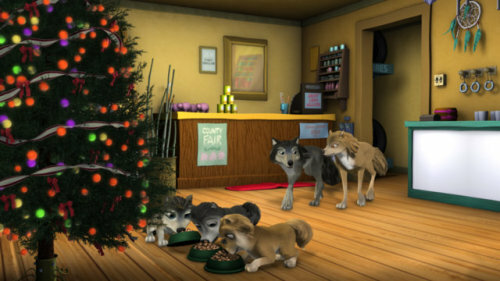 From front to back: "Stinky," "Runt," "Claudette," "Humphrey" and "Kate" in Lionsgate Home Entertainment's ALPHA AND OMEGA 2: A HOWL-IDAY ADVENTURE. The 45-minute movie is filled with action and suspense as well as plenty of the humor and heartwarming moments. Adults will chuckle at the banter between the parents as well as a slo-mo moment when a toboggan takes a tumble and Kat and Humphrey find a second for romance mid-air. My hubby and I certainly were amused by the flick… and we didn’t even have grandkids in the room while watching it. Are you an Alpha or an Omega? For more on Alpha and Omega 2: A Howl-iday Adventure, visit the Alpha and Omega DVD site. Thanks to Lionsgate Entertainment, you can enter to win an Alpha and Omega 2: A Howl-iday Adventure Blu-ray + DVD + Digital HD Combo Pack ($24.99 value). Enter via Rafflecopter below. Entries accepted through midnight MST Nov. 18. Random winner will be chosen and notified Nov. 19. Prize to be shipped by Lionsgate, not this blog.